Yay! Halleljah! I entered my room for one, I could make a racket, I could eat in bed and the wifi worked! Yes I had arrived in Dresden and as all the hostels were booked out when I was looking for accommodation I shouted myself the Ibis hotel. It’s budget, so still much cheaper than others (by about half the price of the other cheapest hotels) and is right in the middle of the old town. Clean, basic and modern, unfortunately it also had a TV and I have no will power. I was glad that my accommodation had worked out the way it did, I realised that I needed some time out to myself and I suspected that there may be some emotional moments which would have made life in a dormitory a little difficult. Sometimes you just need to let the emotions flow instead of having to have the social face on all the time. 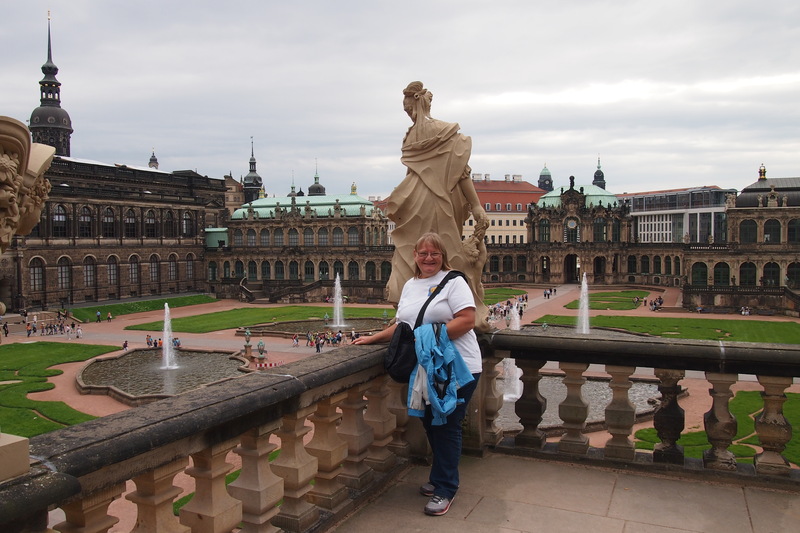 Dresden I knew would be challenging, firstly, because of my Mother’s war experiences in the labour camp close by in Oppach and secondly the devastation of Dresden in 1945. 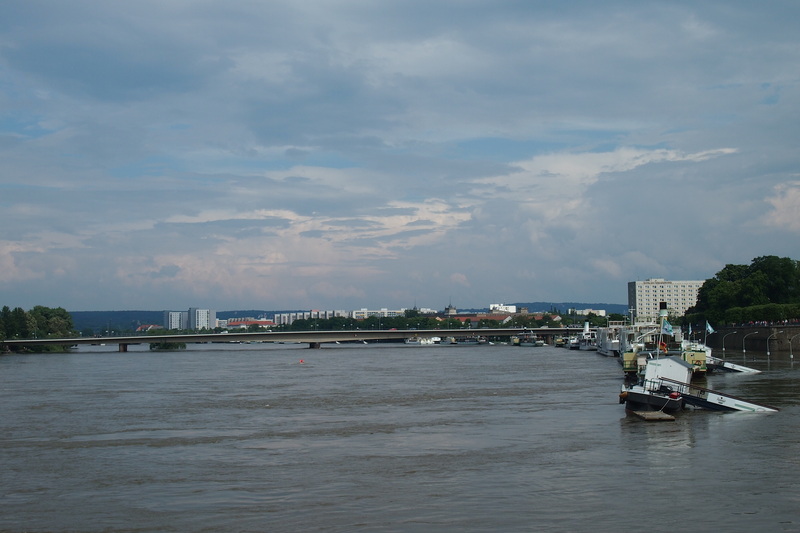 The train pulled out of Vienna and headed north-west for a total of 9 exhausting hours. 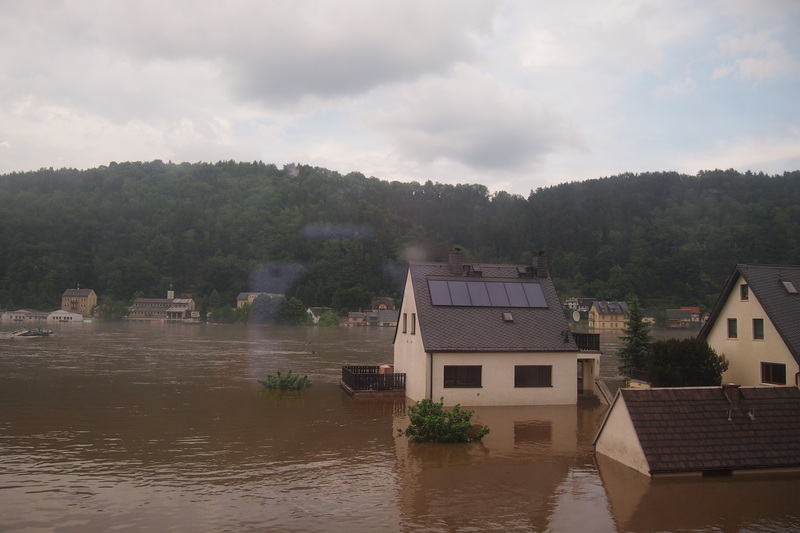 As we approached Prague I noticed the swollen river (I hadn’t noticed before because I was fast asleep). 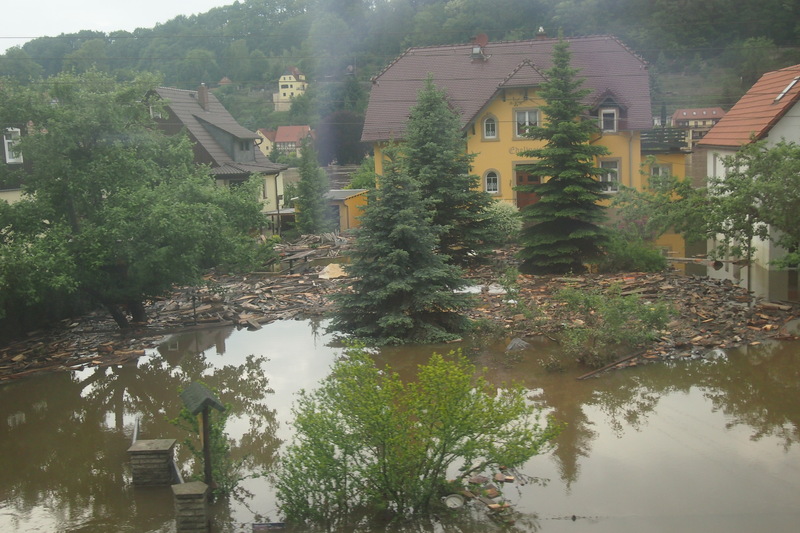 The river Vltava was running fast and obviously much wider than normal. It was getting higher and higher in places and very close to the railway line. I found out later that it was only the day before that the water had receded enough from the tracks to allow trains through. Village after village was underwater, devastation was everywhere, I understood that the constant showers in Vienna were the edge of the rain which caused these floods. As we neared Germany the situation just got worse, visions of Queensland and Queanbeyan came to mind. In one place I noticed a lady looking out of the opposite side window shaking here head and muttering, so I thought I’d take a look and saw that in that spot both sides of the tracks were flooded, the river side and the entire township as well, everything except the rail tracks was under at least 5 feet of water, probably more. A lot of flotsam and jetsam from the floods. 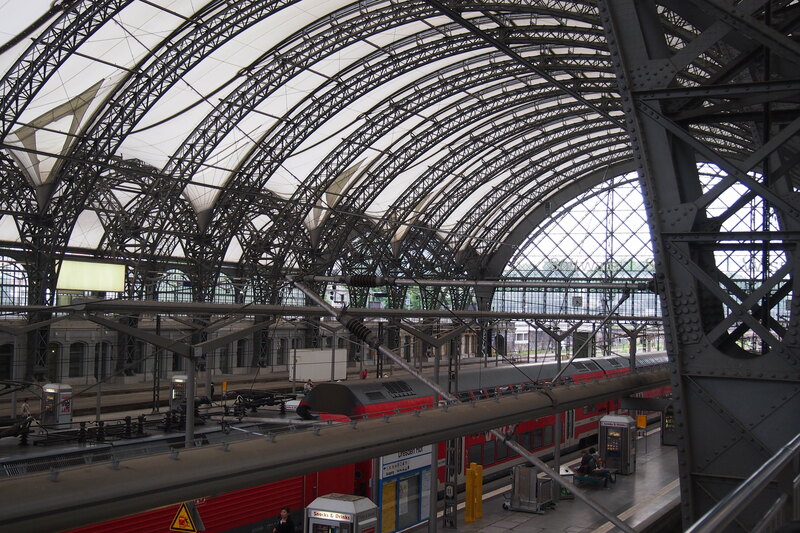 We reached Dresden safely, the railway station there is quite outstanding with an interesting structure. The Ibis turned out to be a good choice!. A clean and modern, hotel quite adequate and right on the main street in the old town so most of the points of interest were in walking distance . There is a massive mall underneath for supermarkets and general shopping, I thought I’d never find my way out of there! In fact I don’t think I ever found my way back to the same door through which I entered during my entire stay. 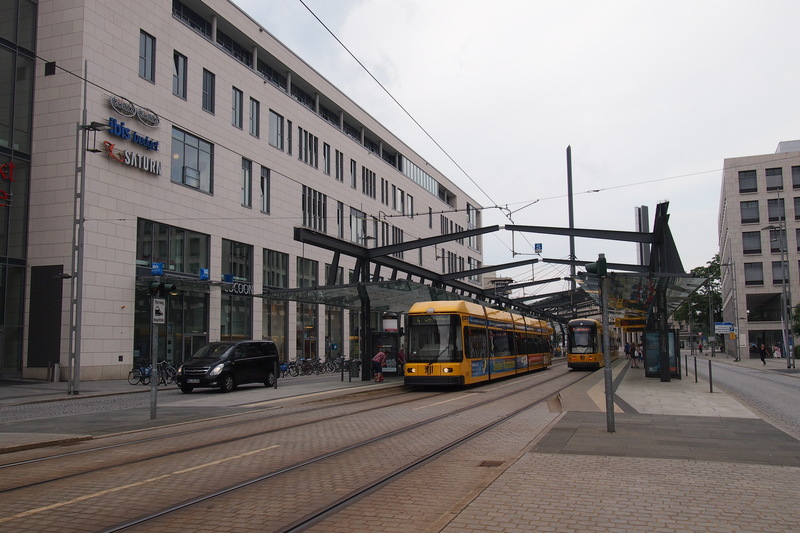 Conveniently there is also a tram stop right in front of the hotel. Dresden tram in front of the Ibis hotel. After what should have been a quick visit to the mall (I spent ages finding the way out as I tend to get very disoriented in large malls) and getting acquainted with how everything worked in my room, I went off for a walk. 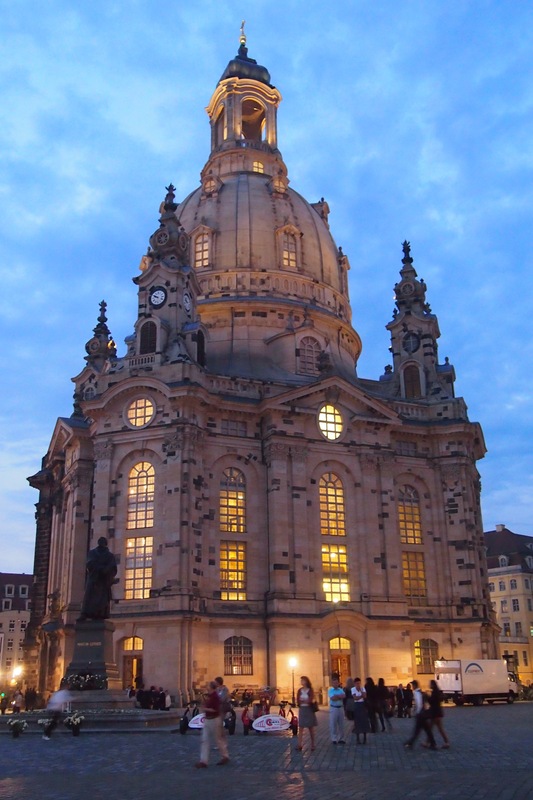 The first amazing building I found was Frauenkirche, that church is just stunning! I took lots of photos, of course, and would return there many times, it is a focal point of the old town. When Ginski and I first got to Ljubljana, and we went for our walk in search of dinner, his first comment was ‘it looks like it’s been built for a Hollywood set’. 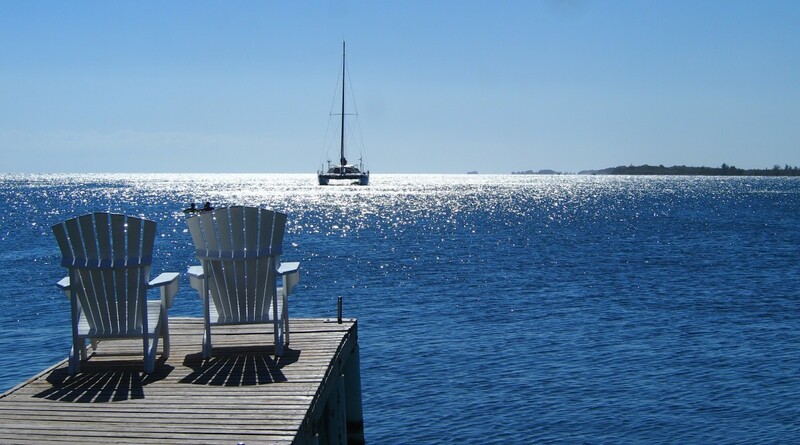 When I got back there and spent a couple of days exploring by myself I could see what he meant, there was a feeling of unreality and being too perfect. I got a bit of that feeling again as I wandered around parts of Dresden. So I started wondering why that might be and it seems to me that perhaps it’s because both cities have been rebuilt after destructive disasters. In Ljubljana it was the 1895 earthquake, and although ‘only’ 10% of the city was destroyed, whole areas were rebuilt and new buildings designed and created. 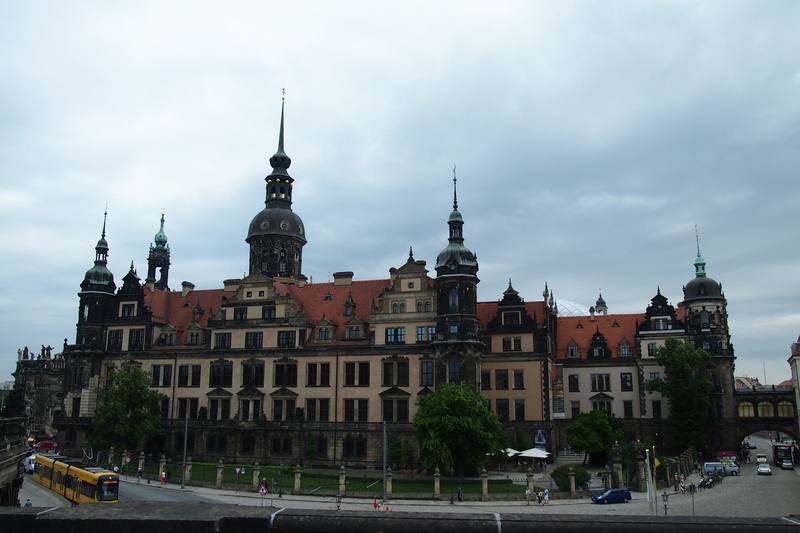 The centre of Dresden, as we know, had to be almost totally rebuilt after that horrific bombing and although there is charred and blackened re-used sandstone in almost every building it has a similar feel. Not as strongly as in Ljubljana but it’s still there. So hard to explain in words, it’s just a weird feeling of unreality. ‘On 13th February 1945, an order was given to lock our gate. We were watching how, that day, from early morning to late evening, column after column was passing our camp. 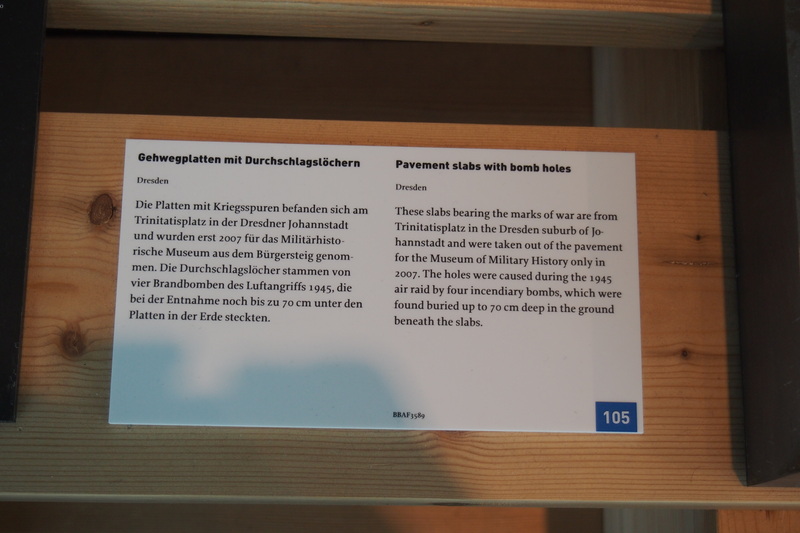 First came the German Army, then Vlasow’s army (Soviet Russians on the German side), civilians, concentration camp men in striped pyjamas, and barefoot Jewish women. They were all going to Dresden. The night was dark. We couldn’t see the bombers, but a formation of them, like a black cloud, was passing over our heads. Squadron after squadron flew over. Then, all of a sudden a blinding light illuminated the whole town. Loud explosions followed. We held each other in a grip. Unbelievable thunder was shaking the ground. Eventually, we realised that Dresden had been bombed. From where we stood, a distance of 75kms, we saw flames rising to the sky and small objects flying around us. The Allied forces had used phosphorous bombs, with the attack continuing for some hours non-stop. At dawn, everything went quiet – only the scream of ambulances driving to Dresden could be heard. The ground around the camp was covered in ashes and fragments of torn books and lots of aluminium ribbons. Interestingly my mother made no mention of the ongoing bombings of 15 February. Perhaps the chaos at the camp and their escape to join the March of Millions wiped it from her memory or perhaps she didn’t want to go into more detail of bombings and wanted to convey what was happening at a more personal level on the march. This is one of the many things I need to read about to fill in the gaps. 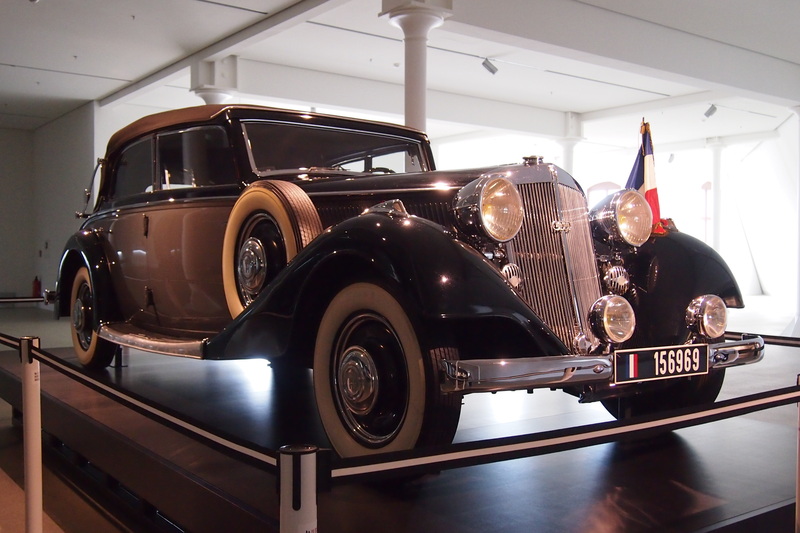 From the Military Museum Dresden. Off I went for a more in depth walk and on the way found out about the castle tours and took a better look at all the sad burnt buildings. Tears welled as I looked at this lovely old town and the re-used charred sandstone blocks in so many of the buildings. All I can say to the citizens is good on you for the massive effort to rebuild and move on beyond what to me is a senseless action. Yes, I know there are many, many senseless actions during wars, this one is just a little more personal I guess, seeing as my parents and the older of my two brothers could so easily have been caught up in it and been wiped out and that would have meant that I wouldn’t have existed. 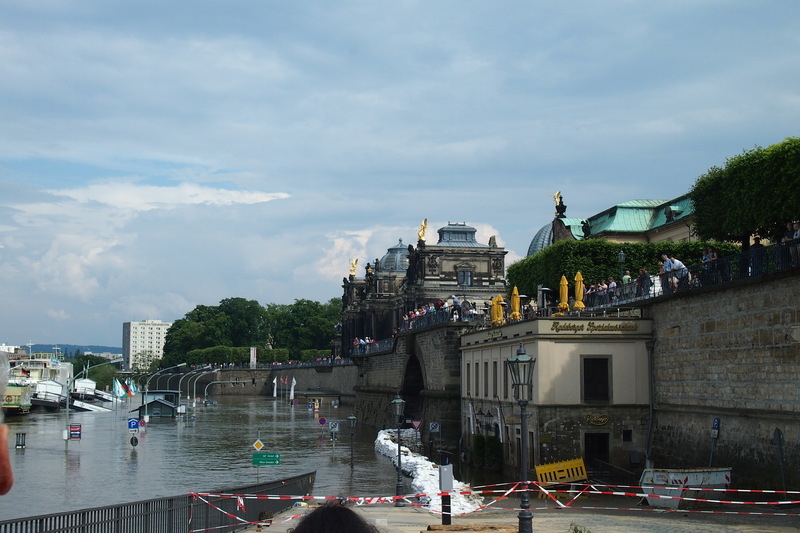 I wandered down to the Elbe to see what was happening there as a result of the flood. The sandbagging was holding well but the river was extremely high and flowing very fast. Street signs were only just sticking up above the rushing river, they were the only indication that somewhere underneath there was a road. Boats and ferries were inundated, the water was so high that there was absolutely no possibility of any boat passing under the bridges. 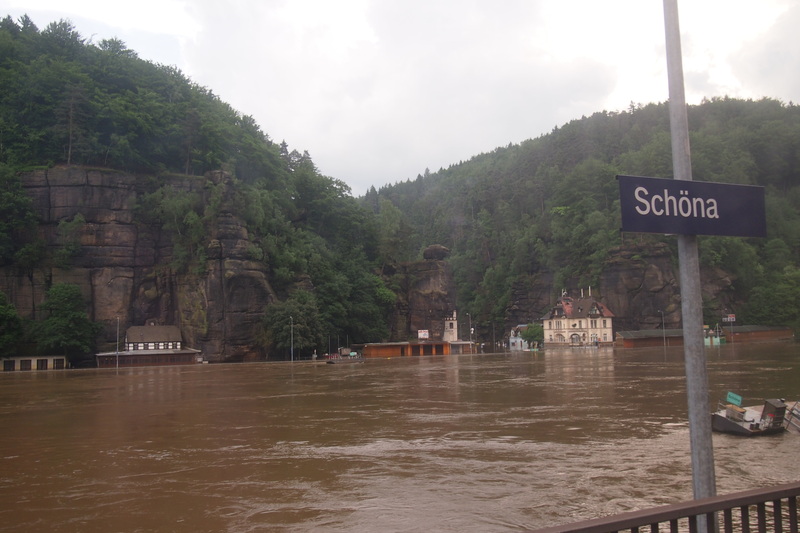 Sand bagging was holding the Elbe back on this side of the river. Sunset found many tourists (including me) on the Augustus bridge. 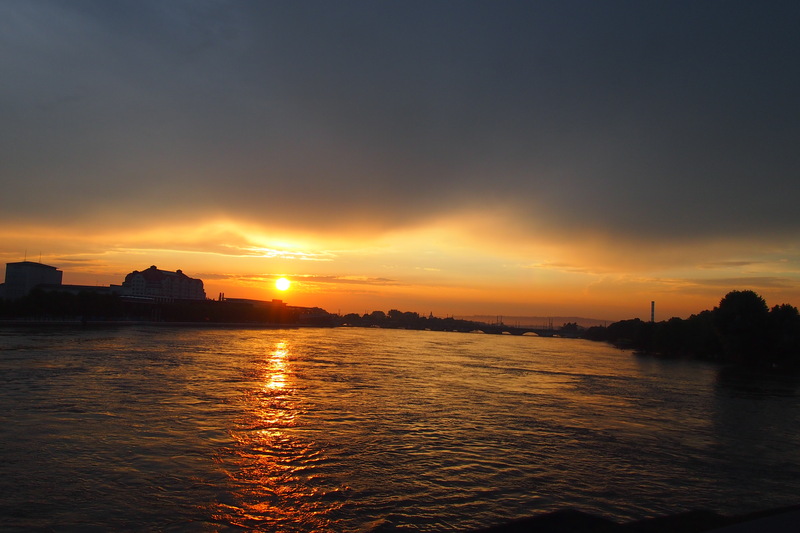 Cameras clicked madly to capture the incredible scene of a flaming red sun setting over the flooded Elbe. That done I wandered back to the central square and sat around waiting till dark to get photos of Frauenkirche lit up at night. It was a delight to just sit and people watch for a while. Such a normal sight, people leaving work, people going to restaurants for dinner, waiters preparing the outside tables for the incoming crowds, tourists wandering around snapping photos, a violin was being played beautifully somewhere in the square and towering above this peaceful scene were the charred sandstone blocks. Tourists and locals out enjoying the evening. It seemed that spending time in Austria and Germany was definitely helping to bring back my High School Germana bit, so I managed to order breakfast without a single English word – well done me! ‘Eine cappucino Italiano, eine kleine espresso UND einen pflaumkuchen bitte’ ok, simple but better than nothing. I got what I ordered in German, good on me! 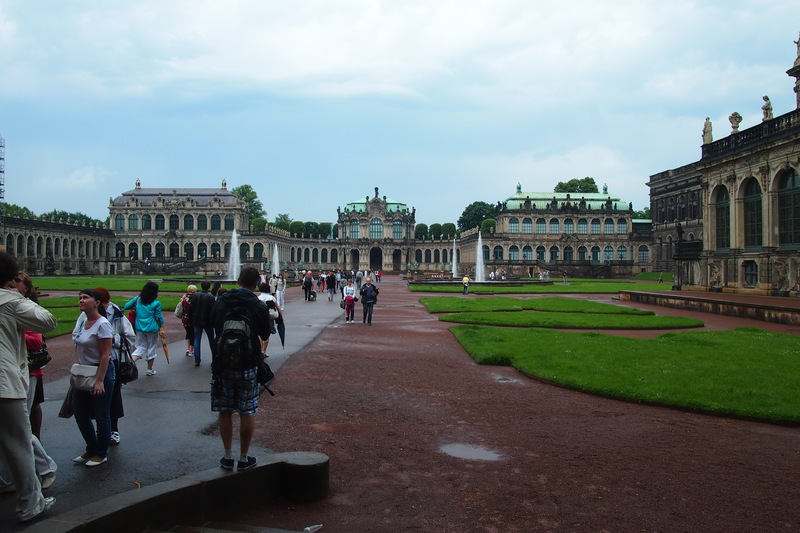 That was followed by a walk to Zwinger Palace which is famous for its beautiful baroque architecture. It was built in 1709. Originally it was an open area surrounded by wooden buildings which was used by the Saxon nobility for tournaments and other courtly events. The sandstone palace was built between 1710 and 1719. It certainly is a stunning work of architecture and a peaceful place to visit (even when it is full of tourists). The reconstruction of Zwinger was completed before the re-unification of Germany. It was supported by the Soviet military administration, and work began in 1945. 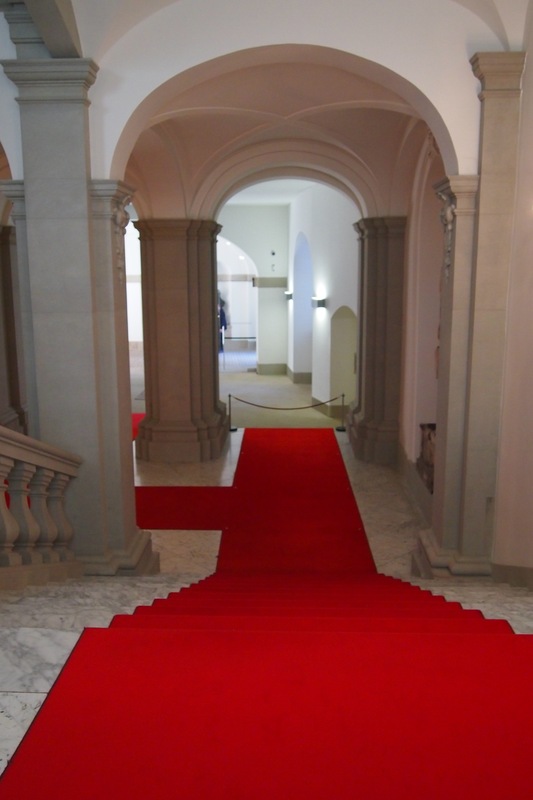 The beautiful Zwinger Palace had been largely restored to its pre-war state by 1963. 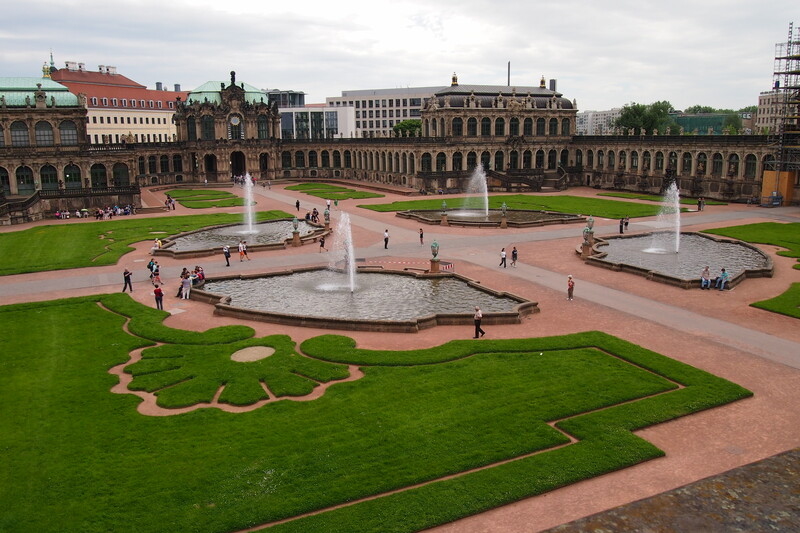 The symmetry of Zwinger courtyard is just beautiful. Having had my fill of wandering through baroque halls and nymph gardens I needed to figure out which tram to catch to the main railway station, then to find out how to get to Oppach, followed by another tram to see the Yenidze building, now that was a strange concept so it is deserving of a bit of description. Yenidze is the name of a former cigarette factory building. 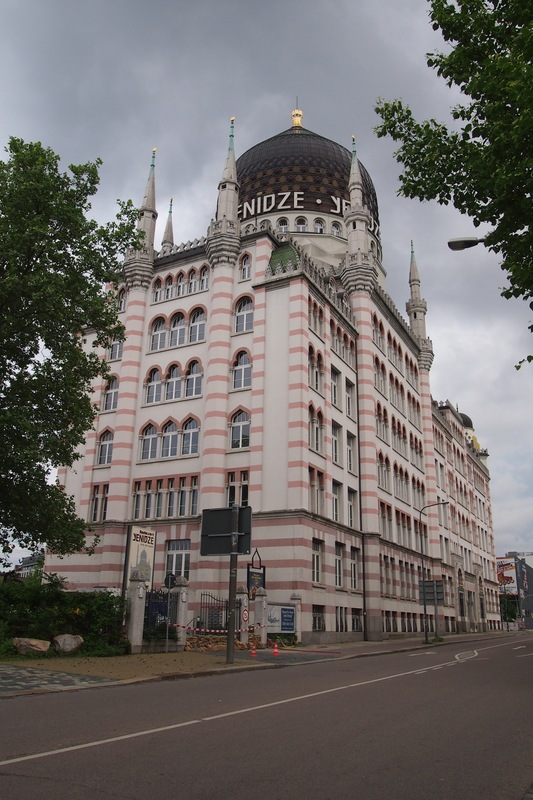 It was built between 1907 and 1909 and is used today as an office building. “Yenidze” was the name of a tobacco company which was started by the entrepreneur Hugo Zietz. The company imported tobacco from Yenidze in the Ottoman Empire. In order to publicise the origin of the tobacco the factory was designed in the Oriental style and to me looks very much like a mosque. Unfortunately you can’t go inside but the outside is certainly worthy of a photograph or two. Yenidze tobacco company building, now an office building. This was followed by a long walk back to the hotel, I was quite proud of myself and my orientation abilities. It’s funny what you can miss at times, I found a Mexican restaurant I hadn’t noticed before right opposite the Ibis. I went there for dinner and was sorely disappointed mainly because everything was covered in pepper. The meal itself I guess was ok but I couldn’t really tell because all I could taste was pepper. Oh well it was back to more exploring for decent food, preferably of the German variety. This day was interesting. I went in search of the Military Museum. First stop however was the VW factory. Another interesting building all glass so you can see what is going on inside. This factory is purely for the building of the top of the range VW Phaeton. The parking for the completed cars is in a multi storied round glass parking station. This is where I first heard of the Curry Wurst. The claim is that it was invented in the VW factory restaurant, true or not, the claim is there. I wasn’t interested in giving the curry wurst a try though, I had visions of the curried sausages we had to make in the staff canteen when I worked with my mother as her Second cook. We both hated the sight of those brown sausages floating in yellow curry sauce (not the most appetising looking concoction) and my mother’s description of them (in private) was also very unappetising, however, the customers loved them. So I wasn’t particularly interested in ending up with something similar. Of course I discovered later that the Curry Wurst doesn’t look like that at all but still…………. 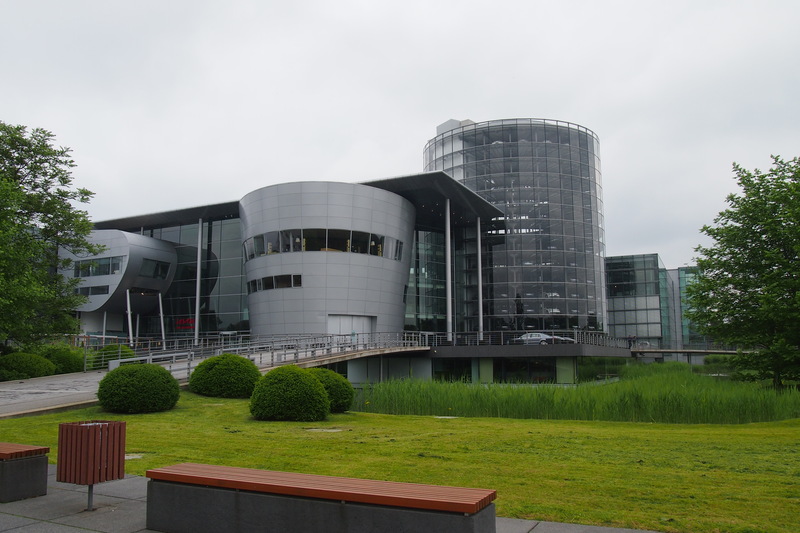 Part of the VW Phaeton factory, the round glass tower is the parking area for completed cars. 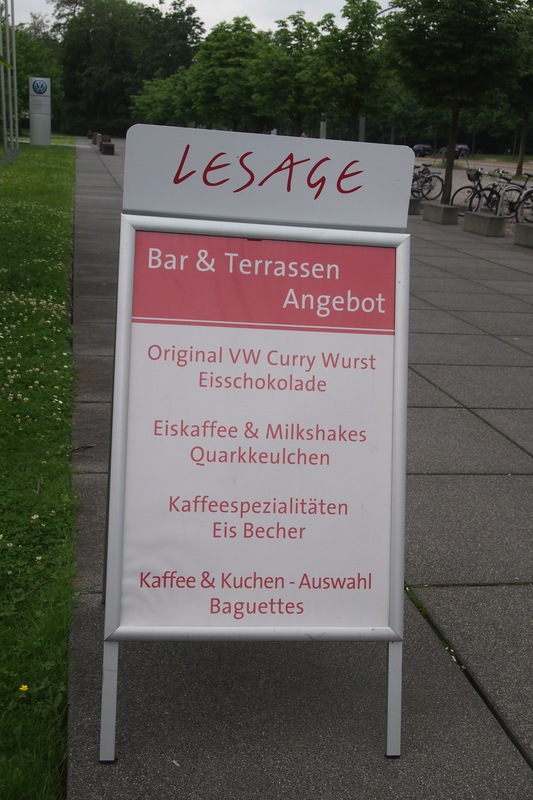 The sign that seems to claim that the curry wurst was invented here at VW. Back on the tram and off to find the Military Museum. It took ages to find it and I needed to ask for directions in a couple of places. Eventually I found the entrance and went in. It was full of interesting information and of course I had several ‘moments’ afterwards on my walk back to the tram stop. 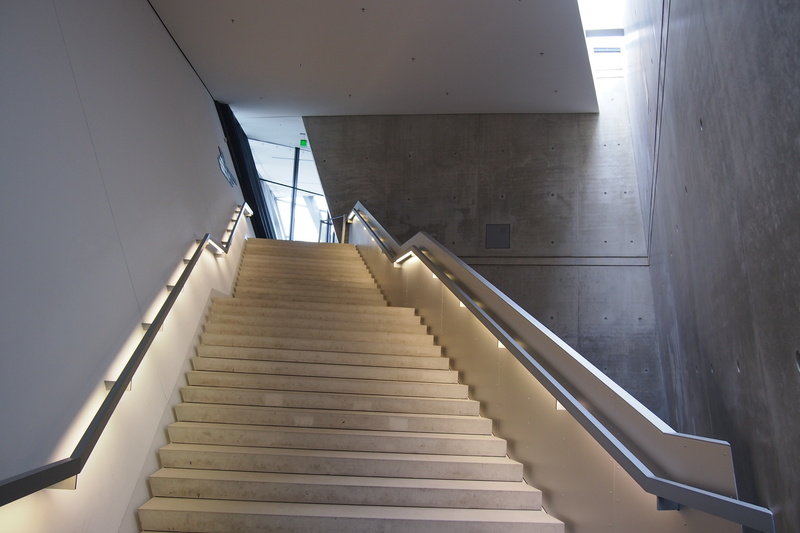 The museum was actually interesting (although the weird leaning internal walls and asymmetry did my head in). 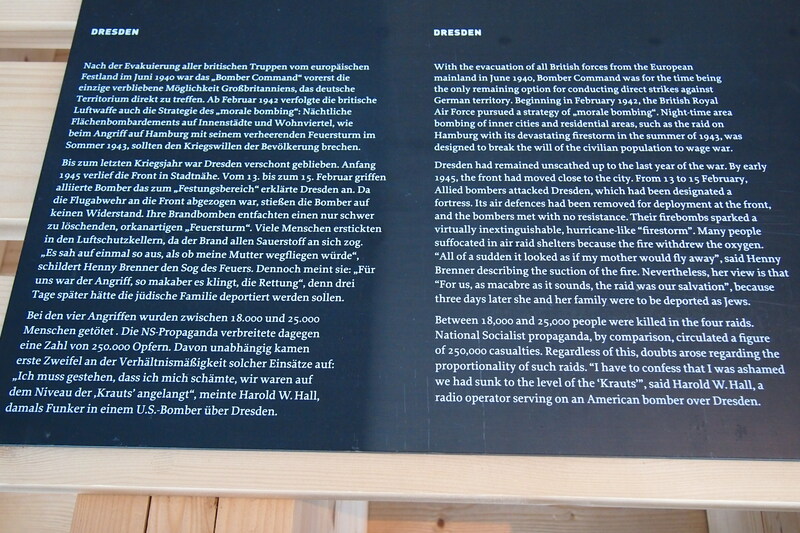 The information was very balanced and at no point did they say anything that was accusatory of the Allied Forces and their attack on Dresden. 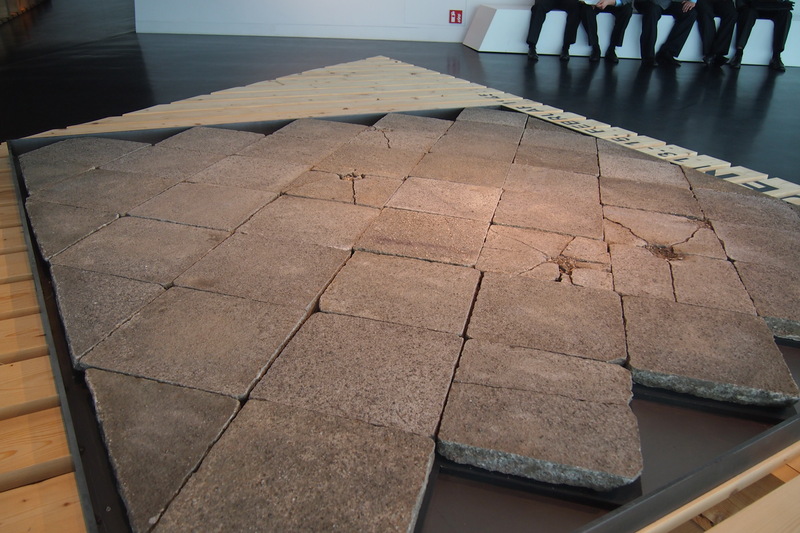 There were just two simple displays of flagstones from both Rotterdam in 1940 and Dresden in 1945 with just the facts of both events. It all got a bit much for me that day. After being in the war museum and walking back to the tram I so missed Mum and wanted to be able to talk to her, just wanted to hear her voice, to talk to her more about her life back then, even just writing this at the time brought tears to the eyes. I so wished that I’d asked more questions when she was with us. The strange angles in part of the MIlitary Museum did my head in. 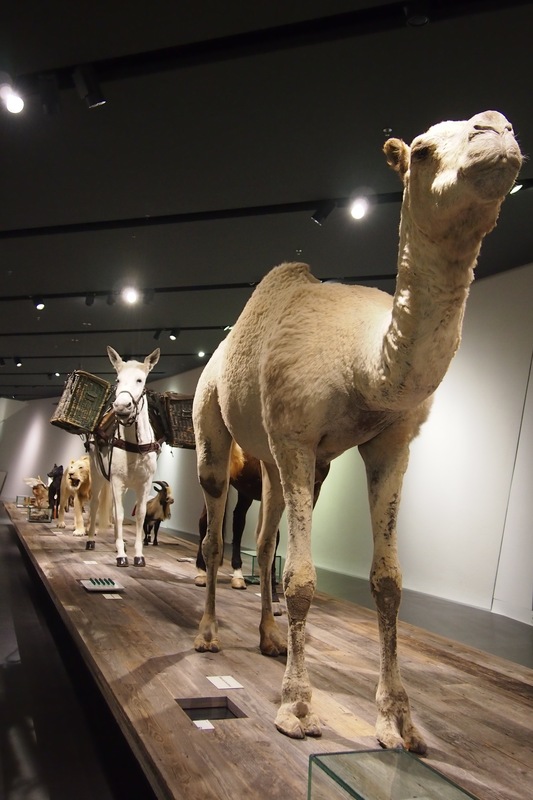 Part of the display of animals used in wars. I was going to check out the Royal Palace but discovered that it is closed on Tuesdays so, change of plan, I decided to walk over the bridge to have a look at the golden rider, and the New Market. The golden rider is indeed VERY golden, sparkling in the sunshine. 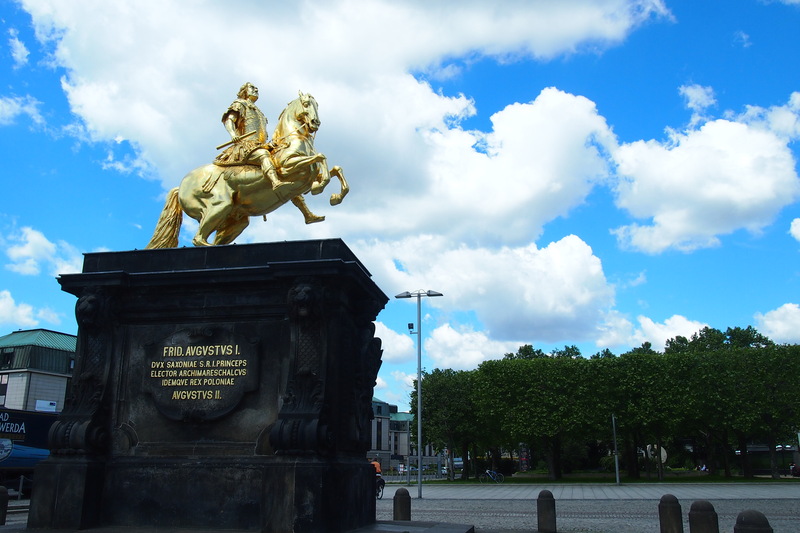 The statue which is in the middle of the Market Square is of a gilded Augustus the Strong seated on a rearing golden horse. It was created by Jean Joseph Vinache and placed there in 1736. Apparently the statue was hidden in a cave during World War II, thus it escaped the bombing. 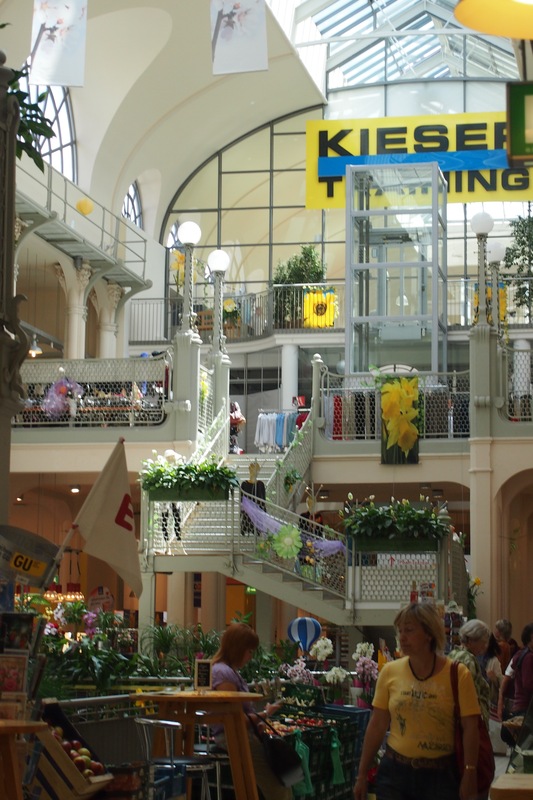 I can’t say I was impressed with the actual market, lovely building but pretty much the same old stuff as everywhere, a few clothes shops and some fruit and vegetables stores, not much though. Nothing like Naschtmarkt in Vienna. A bit of the New Market. 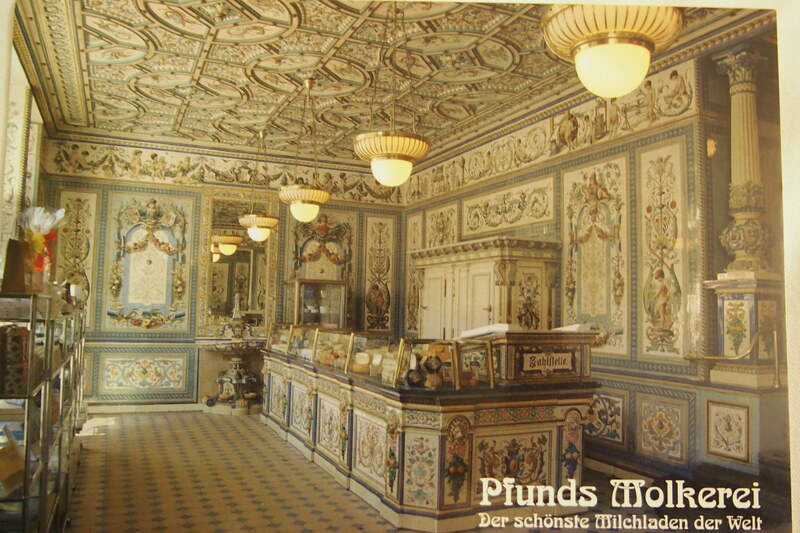 So I figured I’d go and find the Pfund Dairy (Pfunds Molkerei), apparently it’s in the Guiness World book of Records as the most beautiful dairy in the world. Well, that was some walk! Part of the way I walked along the river, there is a café near the river called Kaffe Rosegarten that was destroyed by the flood. 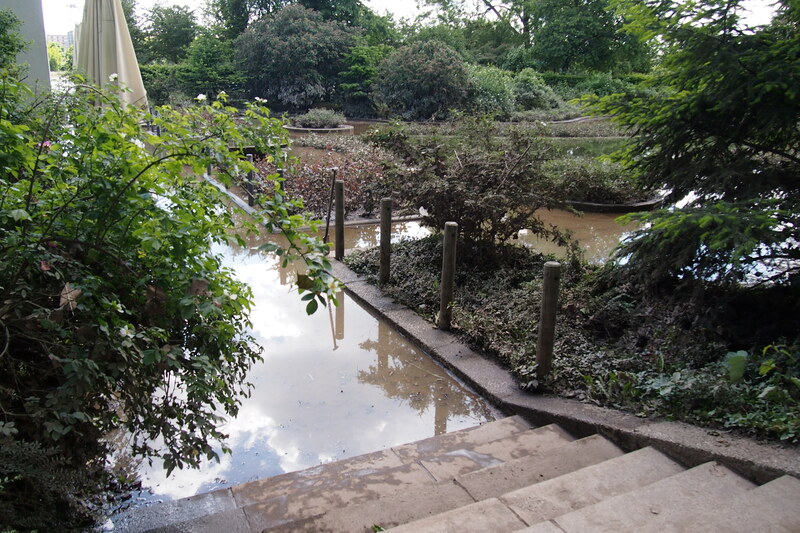 The garden was certainly still under water and the inside looked devastated. I guess that all the flood precautions created to protect the main part of the city didn’t help this area of the river. It was so sad to see because it looked like a beautiful café and lovely rose garden. I finally found my way to the dairy at 79 Bautzner Strasse, and yes it is lovely! Totally covered in beautiful scenic tiles. Unfortunately, again, you aren’t allowed to take photos, so I had to buy a couple of postcards instead and take photos of those. I’d love to go back one day and have the time to stop and have a milkshake. These days it is more a gift shop/milk bar but they do still have a dairy elsewhere and use the milk from there to make various products like milk grappa and milk soap as well as the milk shakes and coffee. I tried to be sneaky and use my long lens once I got outside and across the street but there are so many roadworks and large pieces of equipment around that it was impossible. Photo of a postcard of Pfunds Dairy. Then it was another long walk to the tram stop. 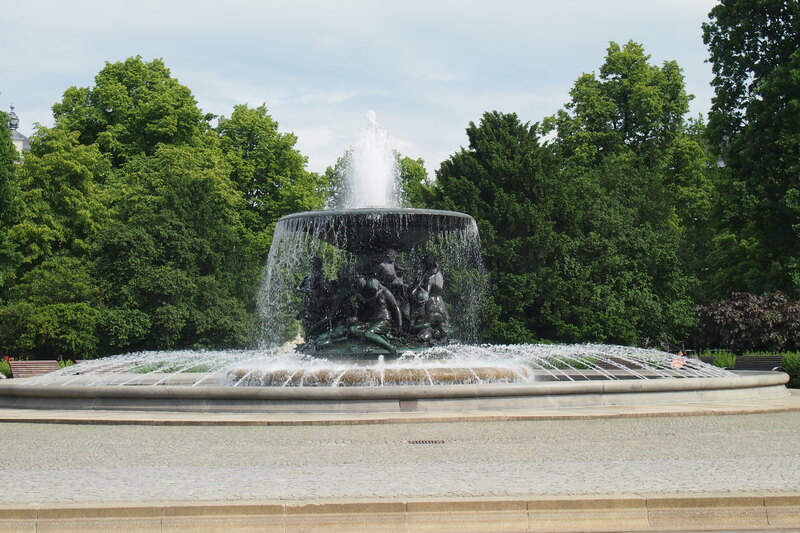 Due to the road works the tram lines were also dug up and the tram stop on Bautzner Strasse was not in service so I had to walk back to Albert Platz where there are some stunning fountains. I was beginning to become orientated in this town. The Still Water fountain at Albertplatz, one several fountains in the area. Finally I got back to the hotel and after a bit of a rest I decided that I should check out the 2 churches that I hadn’t visited yet, the Kreuzkirche and the Hofkirche. The Kreuzkirche is the Protestant cathedral the seat of the regional bishop. The church holds close to 4000 people. Kreuzkirche was yet another building destroyed in 1945 then rebuilt and finally re-consectracted in 1955, there is quite a history to this old church. 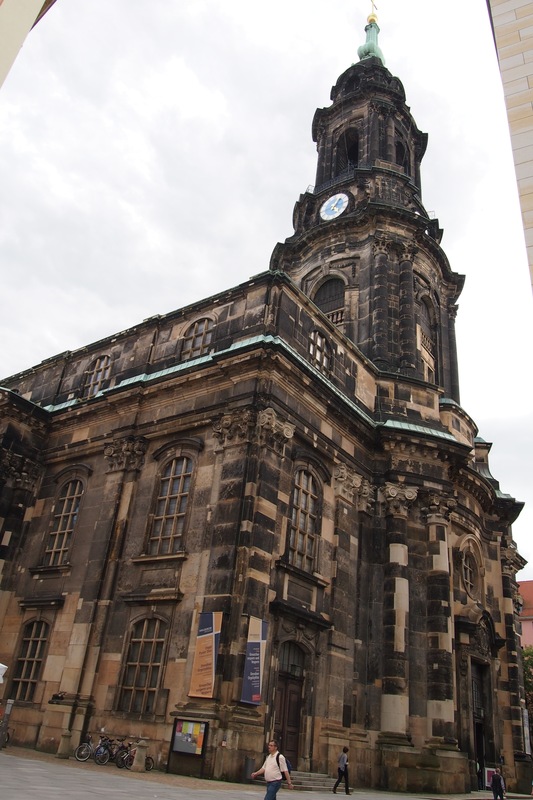 The Hofkirche is Catholic. Yes, also badly damaged in the bombing and although the reconstruction was begun soon after the war it wasn’t fully completed until 1987. There is a story that the reason the Hofkirche has a double aisle is because Catholics were only allowed to have services in an inner room, I’m not sure about this and I can’t find any reference to that story other than what was in the local tourist information. Perhaps you lovely readers can help out with this one. And that was enough for one day, I was hoping to go to Oppach the next day. The plan was to go to Oppach, a 75 km train and a bus trip to where mum was in the labour camp and my brother Victor was born. But I woke up thinking that I shouldn’t go. It wasn’t laziness, just this real feeling of I shouldn’t go, I lay in bed and thought it through and couldn’t even make myself get up and get moving. Finally I realised that this is one of those intuitive feelings I should pay attention to. My philosophy in life has always been ‘if in doubt, don’t’ and whenever I’ve gone against that I have struggled and ended up unhappy or unsafe. So decision was made, not to go. Out of bed and showered, next decision, where to have breakfast and what to do instead of the trip. I did find out later that it was probably a good thing I didn’t go, as out there it was rare to find English speakers and although that in itself is not a huge problem there was also the possibility of no bus back and no accommodation to stay the night. I may be adventurous to a point but taking that risk on my own wasn’t a good idea. Glad my intuition kicked in. And so it became Royal Palace day instead. Coffee and croissant (favourite breakfast) across the alley from the palace at Emil Reiman Café then the palace with the 2 treasury vaults. Wow! Those vaults! What incredible works of art were collected. In those days everything was a work of art really, from paintings and statues to crockery and cutlery – spectacular. 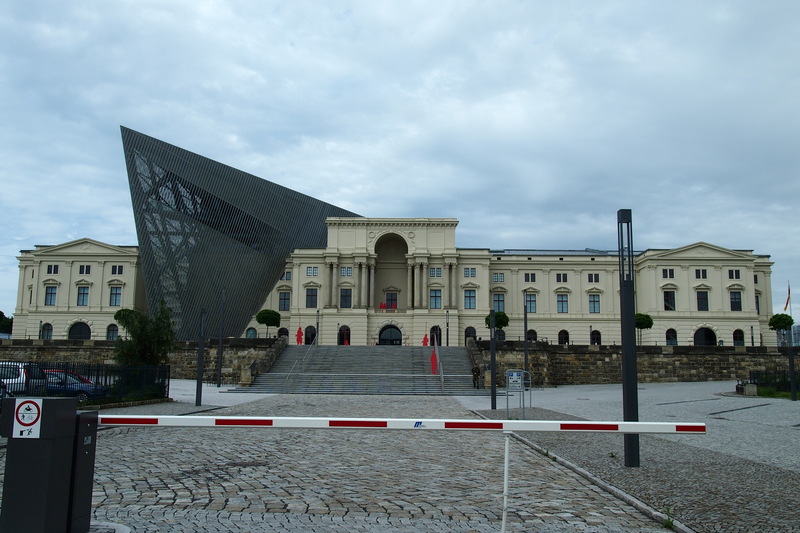 Of course this is Dresden, and you can’t avoid reminders of the destruction. This poor castle was almost totally destroyed, however, miraculously some rooms and their contents were untouched, mainly because of it’s structure and being on the outside wall. Had they been facing the internal square they would no doubt also have been destroyed by the extremely high temperatures of the fires. 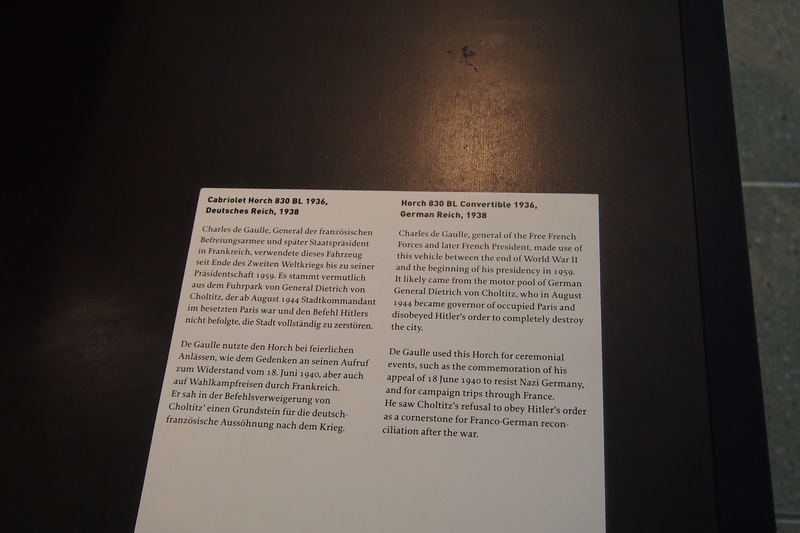 Luckily so much survived for us to see, and for that which didn’t survive, there were paintings, photos and descriptions so they could be replicated. I woke up out of a couple of weird dreams, one an unpleasant one about spiders and the other about a friend and my sons. At the same time I was singing La vie En Rose in my head. What a strange combination. Walking forward to yet another monument. And continue toward yet another monument. I think I should do this more often, ie not rush into the day but spend a little time thinking and writing. Isn’t that the way? 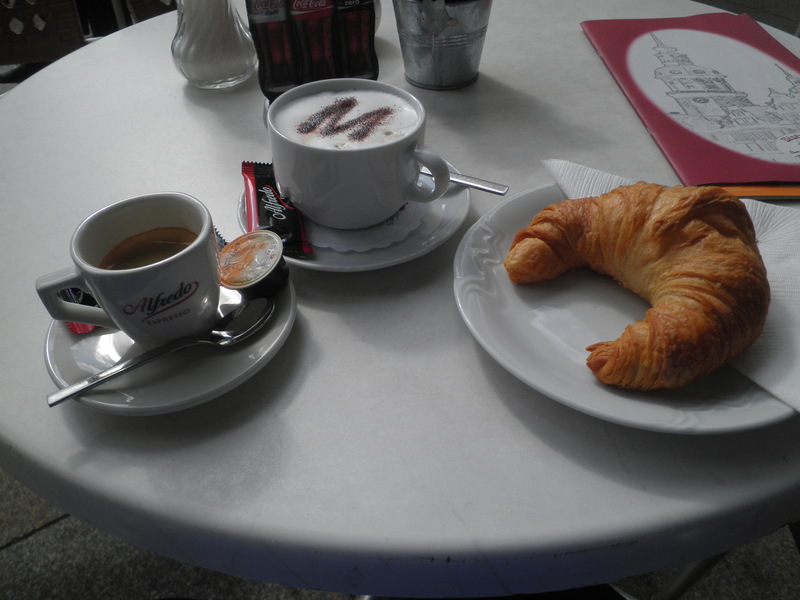 My last few hours in Dresden and I finally found the best cappuccino, the best espresso and the best croissant in Dresden, at Café Am Schloss. Such a nice way to finish a trip to this chilled out city. Not quite as chilled out as Belgrade but seriously, not many people are in a hurry here, perhaps it’s because what you see most of are older German tourists, but even so it’s a feeling. 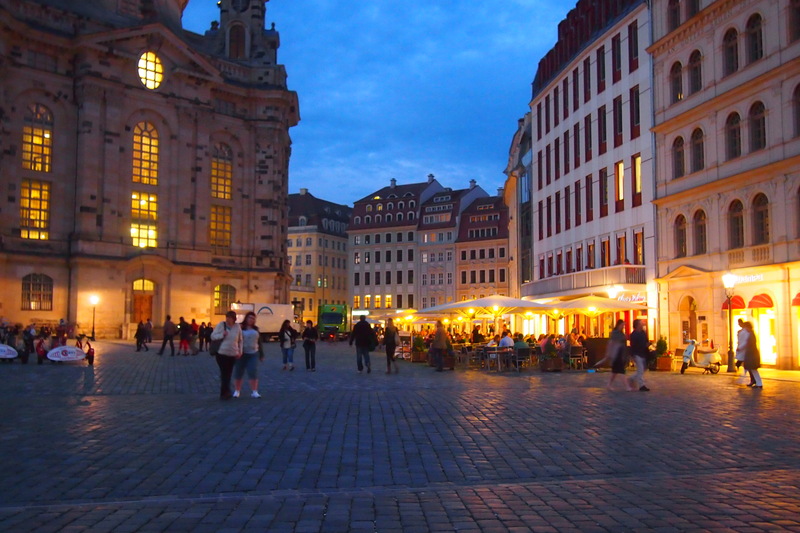 So don’t be in a hurry in Dresden especially in cafes. 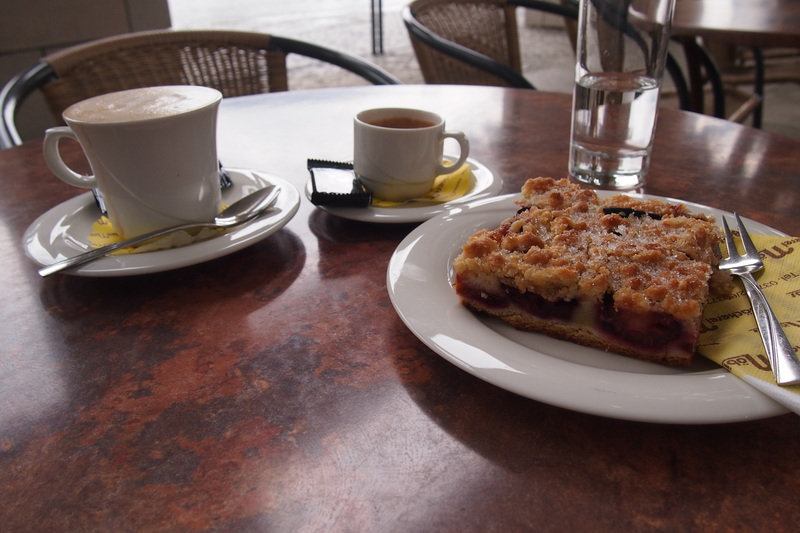 Last breakfast in Dresden at Bistro Cafe Am Schloss – the best coffee in Dresden. 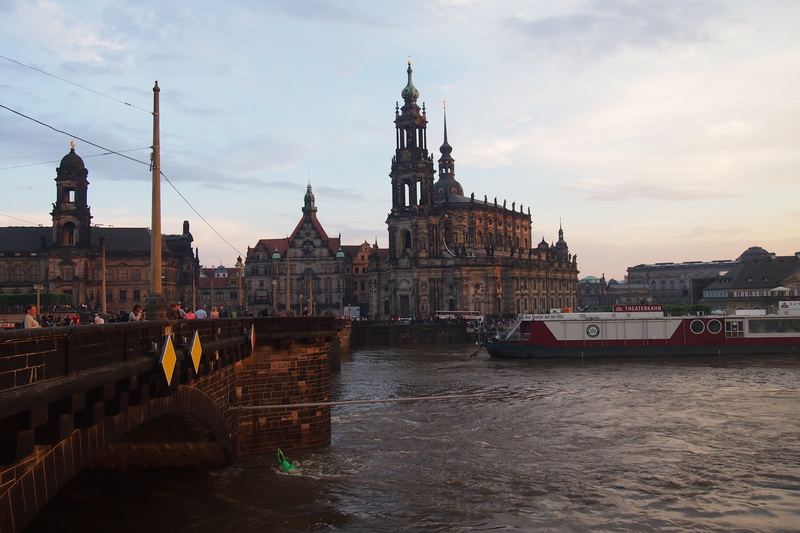 Farewell beautiful Dresden, time to hop on the train, next stop Berlin.